As China rushes to rescue thousands of people buried beneath the rubble from a massive earthquake, a number of British families await news of their missing relatives. Their loved ones are among 19 tourists who remain out of contact in a devastated area. Liz Cullen, 46, was travelling with her friend Emily Hale, in her 60s, on a 15-day China journey - the highlight being a trip to see pandas in the Wolong Nature Reserve, the world's foremost conservation, research and breeding centre for giant pandas. Her sister Christine last spoke to her on Sunday - one day before the 7.9-strength earthquake rocked Sichuan province, demolishing homes, offices and schools and burying thousands of people beneath the rubble. With roads blocked and communications cut, the devastation in the worst-affected areas has yet to be fully assessed. 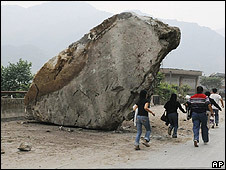 For Christine, the greatest fear is that the coach Liz and Emily were travelling on with other British tourists crashed during the tremors, leaving them injured or worse. The route to the 2,000 sq km reserve is through a rugged area north-west of Sichuan's provincial capital, Chengdu, not far from the quake's epicentre. There are many bridges and mountain passes. A less alarming scenario for Christine and her husband Simon is that they are merely trapped by landslides - "not in danger or injured, but simply trapped and can't get out" of the area. Christine has been "trying to pin down" from her sister's tour operator Kuoni exactly where the group were when the quake struck. "We've heard a rumour that another group saw Liz's group at the reserve before the quake struck, but we can't take that as a reassurance that they are safe". In the phone conversation she had with Liz on Sunday, they discussed the cost of holding a baby panda. "Liz said she had heard it was £500 - I don't know if that was true or if she'd been misinformed, but she was outraged at that." Christine encouraged her to spend the money, as Liz is single with no children and was just about to sell her house in Eastham, Wirral. "I told her it was a once-in-a-lifetime opportunity. She's waited a long time to go to China. I hope she got to do it." Staying by the phone in case of news, Christine says she is trying to stay positive for the sake of her mother, who lives with Liz and is in her 80s. "I'm trying to keep things positive for Mum, but the longer it goes on..." Christine doesn't finish the sentence. She and her husband have discussed the possibility of going to China themselves, but at this stage feel they would be more of a hindrance than a help. "I'm very wary of leaving Mum and taking myself off somewhere," she says. "But if Liz was found injured and in hospital, then one of us would go. At this stage there's very little we could do that would be of use - I don't speak the language, it's chaos out there." The 86 giant pandas at the reserve have been confirmed as safe, but Christine's husband has expressed concern that there is no news on the tourists. 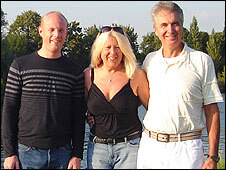 Meanwhile, Dan Shepherd fears for the safety of his mother, Janet, and her partner, Brian Mitchell, who were also taking part in the tour with two friends. Mr Shepherd, 31, from Surbiton, in London, last heard from his mother by e-mail last Thursday. "We're just waiting on any news at the moment. We're really concerned and praying that they come back safe," said Mr Shepherd. "My worst fear is that it will drag on for a long time and there is a bad outcome at the end." He said Kuoni was his main point of contact and had been "really good at providing us with regular updates". Mr Shepherd said he spoke to a representative for the company earlier who told him Chinese troops were heading to the reserve, although he added: "We're not sure how long it will take for them to get there." He described his mother and Mr Mitchell as "very active" people, with China being the latest in a number of activity-filled holidays. 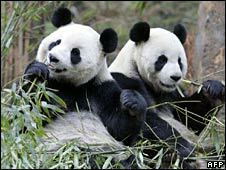 Prior to setting off for the panda reserve, his mother and her partner had been on a cruise, followed by a few days in Beijing. Simon Wagener's sister-in-law is also among the missing tourists who had set off for the tour. He said information was hard to come by. "We haven't really heard anything from the official bodies, from the Foreign Office or the embassy, that we've been in contact with." He said he was "glued" to television news channels "for a small scrap of information that might say the group of 19 has been found safe, but they're not being mentioned very often". Mr Wagener added: "I wanted to contact the BBC and say could you please make sure everyone knows that there is a group of British tourists out there." A Kuoni spokeswoman said there was no news on the 19 tourists, but the company was in regular contact with the Foreign Office in Chongqing.